We have some good friends who live in Pensacola and we haven't visited them in a while, and Sarah hasn't been to the beach since she was 9 months old, AND Cody's never been...so we recently invited ourselves down to their place for a visit. 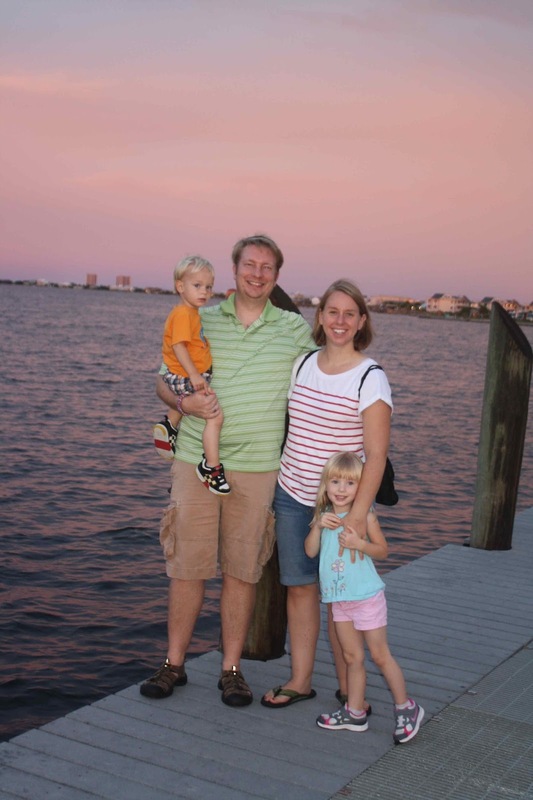 Thankfully, they tolerated our imposition and welcomed us down for a nice weekend at the beach. Stephanie and Michael have been wanting to try out paddle boarding so the rented a couple the first day we were there. The guy said the morning cloud cover was supposed to clear out and then be good until 3 when the rain was going to set in. This was not the case. However, not to be deterred we set out to the sound side and hoped the skies would clear. We did get about a 2 hour break in the rain in the morning and unloaded the boards and toys. 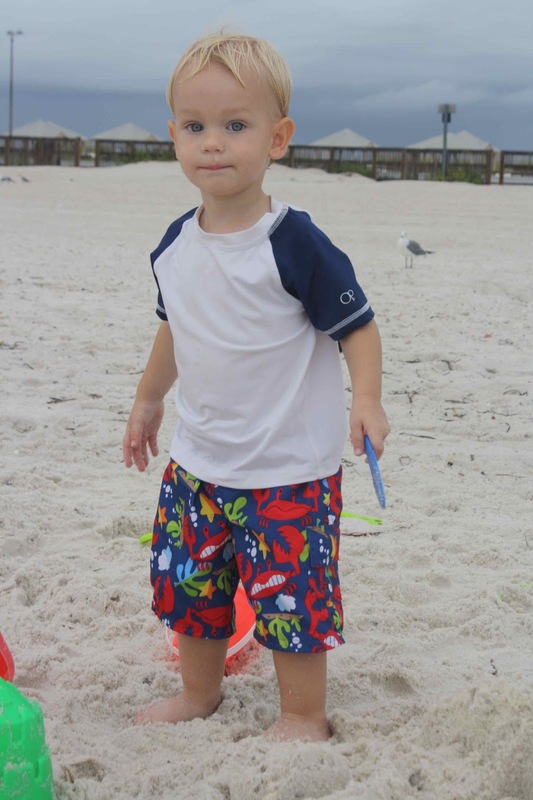 Cody immediately set out digging holes and building sand castles. Yelling, "Mommy! Watch this! 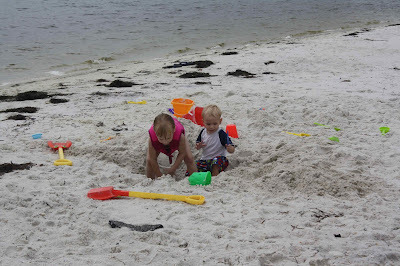 Sandcastles in sand!" Chris and Stephanie were the first two out on the boards and while Stephanie did fall off her first time getting to her feet, Chris only stumbled a bit. I would like to point out when it was mine and Michael's turn to try we didn't fall at all. Ha! 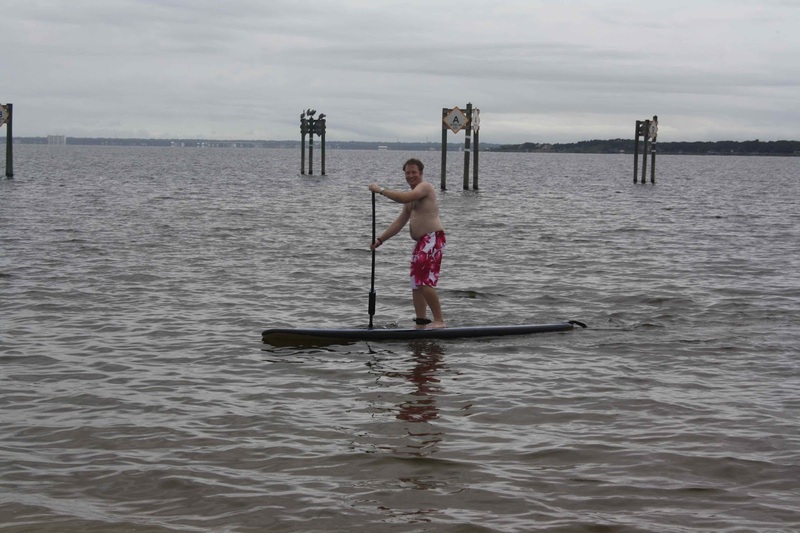 But everyone did eventually get the hang of it and paddle boarding was tons of fun! It's surprising how many muscles it takes to do it. Aside from the obvious core control to stay up, and arms and core to pull the paddle the outsides of my calves were also screaming at how much work they were doing to keep me stable and adjust to the waves. Thank goodness Sarah has a lifejacket because, as I'll mention a few times, she is not afraid of the water. I asked if she wanted to ride with Chris and then he set off without her to get the hang of it. I turn to look at Cody for just a second and she's swimming out to get on the board with him yelling, "Wait Daddy! Come back! I want to ride with you!" I had to go out over waist deep to catch up with her and bring her back in to wait for Chris to come back with the paddle board. Meanwhile, Cody wanted NOTHING to do with the water. He was perfectly content to keep playing in the sand. That is until he noticed all the birds. 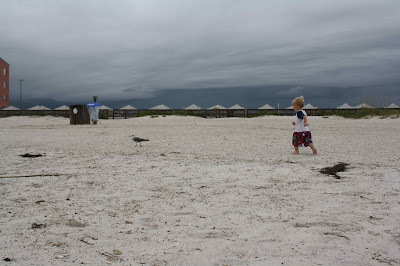 Then he spent a fair amount of time chasing them. As you can tell in the above picture our break from the rain was quickly coming to an end. 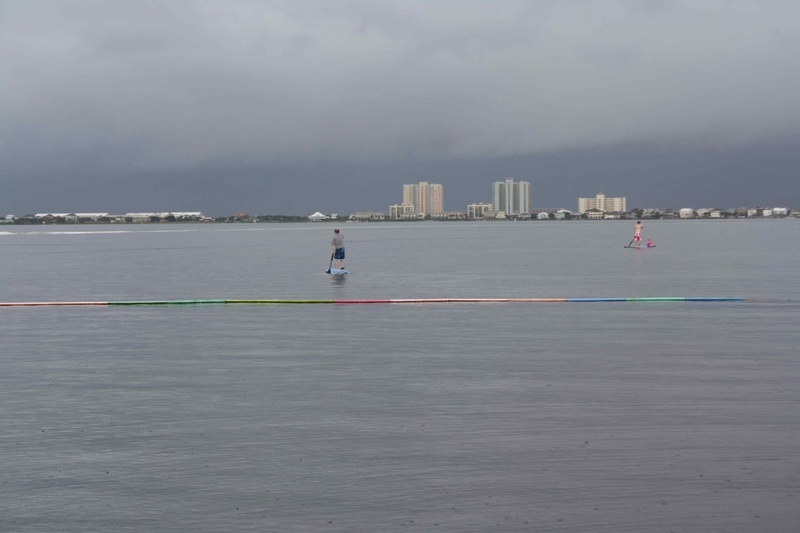 The sky over the gulf was getting dark fast and so we started moving as quickly as we could to pack everything up and get the boards loaded back onto the car. We didn't make it and did get caught in the deluge while loading. So to make the most of the rain time we headed to lunch and enjoyed some fresh baja style mexican food and took a walk on the boardwalk. I'm so confused by beach names. 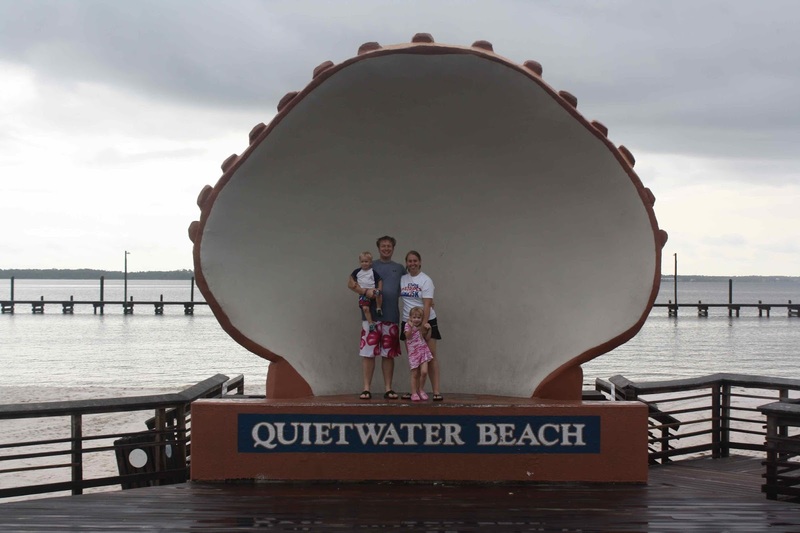 This says we were on Quitewater Beach, but I thought we were at Pensacola Beach. No idea. 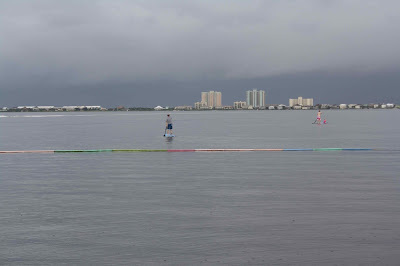 After lunch and with blue skies off in the distance we tried another beach on the sound, Gulfbreeze I believe was the name, to see if we could do some more paddle boarding. 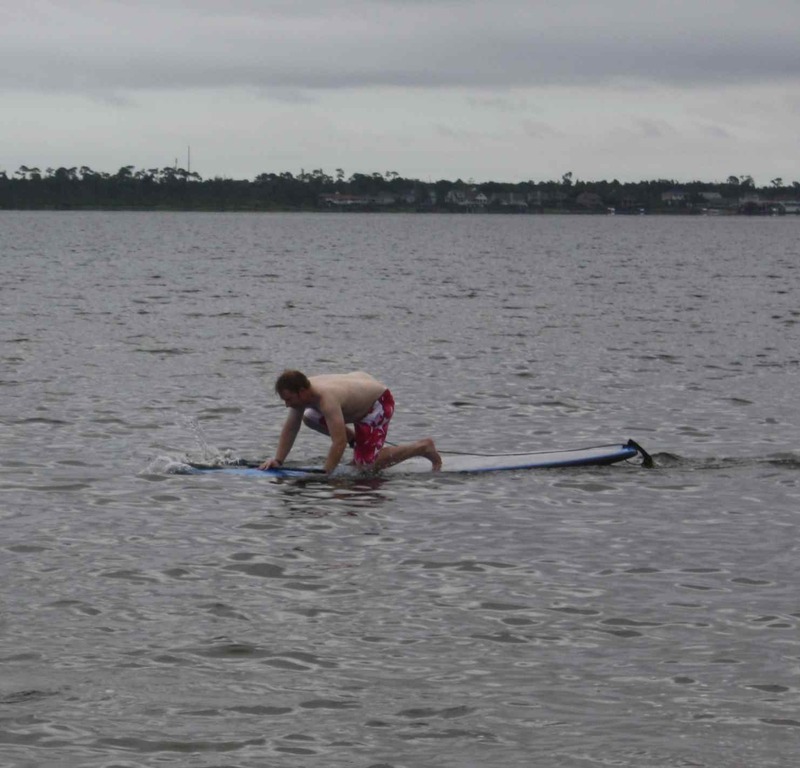 The water was much calmer there and the guys were able to go out much father on the boards. Chris is the tiny dot on the right, and that little pink thing at the front was Sarah. 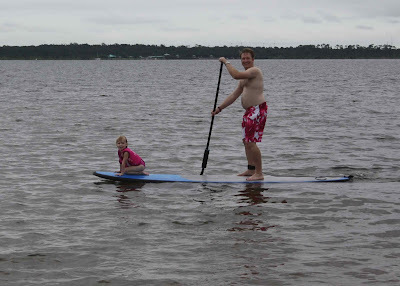 With the water being calmer and Chris better at paddling boarding by this time Sarah was also more comfortable. He said she was dipping her toes in the water and leaning to the sides to run her hands in it. She was having a great time. However, as you can tell by the dark skies our break in the weather was short lived and we got stuck under a very nice pavilion for about an hour loading in small spurts while the rain wasn't "coming down too hard" as we packed everything up. 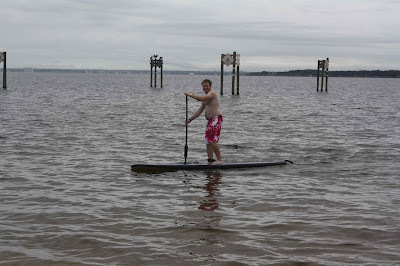 Paddle boarding was tons of fun and when we go to the beach again I would definitely rent a pair for the family to use. Especially when the kids are older and Cody can also sit on the front of the board. That would be a nice way to spend the day playing at the beach. We headed home after that to grab some showers and get ready to go out to eat. Of course, while we were all cleaning up the rain completely cleared out and we had a beautiful evening. We ate at Hemingway's and were able to sit out on the balcony and enjoy the view. Chris and I both had awesome steaks. I don't buy souvenirs on vacations, instead I bring home a souvenir 10lbs because I eat like crazy while on vacation. Most of my time is spent considering where and what to eat next. Dessert at lunch! Heck yeah! 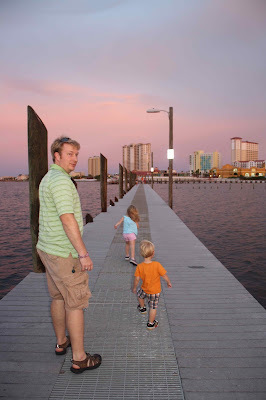 And then since it wasn't raining we enjoyed a nice walk on the board walk and piers. Except it's not nice for a mom who has a fear of heights and anxiety over some fearless children. Sarah was running around like a crazy woman and Cody, not to be out done insisted on yelling, "Mommy! Watch this!" And would then proceed to run, jump as high as he could in the air, and land on his but. 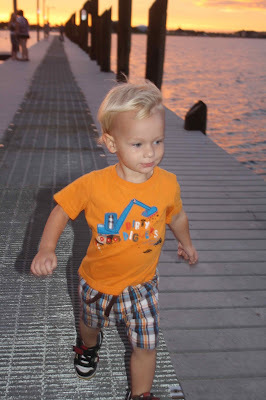 The meantime I'm telling them to stay in the middle of the pier and don't get that close to the edge, and stop running! Sarah did eventually fall down and scrape up her knee pretty bad but thankfully we had gotten this wonderful family picture first. I love the last pic! Looking good, Schwartz fam! Aw that's a great family picture. Love the sunset sky color for the background. And look at your getting semi close to the edge, lol good job! Great pictures, it looks like you guys had a fun time. I'm with Cody, no water for me either. I'm scared of the ocean (yes, for real.) I love the picture of Cody running after the birds. Super cute. Looks like a great time for the Schwartz's!! !